Working 12-hour days, serving on 32 committees and a gambling addiction. Meghan Melnyk had a lot on her plate prior to an alleged bank robbery. She was “insolvent and extremely burnt out,” defense lawyer Derek Lovatt told the court during her bail hearing in early March. “This is a person who was overworked and allegedly made a terrible decision,” Lovatt said. The Mount Royal University community was left stunned as Melnyk was arrested and charged with robbing a credit union. Before 2 p.m. on Feb. 29, police said a woman entered the Servus Credit Union in southeast Calgary, wearing a tuque and sunglasses. She handed an envelope to the teller with a note saying she was armed and demanded cash. The teller gave her $6,180, along with a dye pack and bait bills. As the suspect fled in a PT Cruiser, Servus employees wrote down the license plate number. Police reported spotting a car matching their description with the help of the HAWC2 helicopter. When they stopped the car, the driver, Meghan Melnyk, was arrested immediately on charges of robbery, possession of a prohibited weapon and committing an indictable offense while disguised.Melnyk was alone in the vehicle with her German shepherd dog. Police found money and a butterfly knife in the car. At the time of the arrest, police also executed several outstanding warrants for fraud, uttering false documents and breach of probation. Melnyk was let out on a $6,000 bail on March 7. 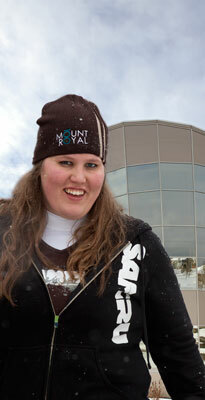 She was barred from coming within 100 metres of MRU and serving on the 32 committees. Only a month earlier, Melnyk had resigned from her position as president of the Students’ Association of Mount Royal University after a periodic review uncovered “financial anomalies,” according to the Students’ Association. Court documents later revealed the Feb. 29 arrest wasn’t Melnyk’s first brush with the law. Despite holding various positions on the student council since 2009, she was seemingly able to keep past criminal charges a secret in her professional life while serving as health and community studies representative, VP external and president. In 2008, Melnyk was convicted for possession of stolen property, a 1998 Ford Explorer, in Whitecourt, Alta. She wasordered to serve 150 hours of community service, which were not completed. On Jan. 22, 2010, she was once again convicted, this time of applying for a false social insurance number. She did not pay the court-ordered $500 fine, but was elected as SAMRU’s VP external just 19 days later on Feb. 10, 2010 after running uncontested. At the time of her recent arrest there was also a warrant out for charges of uttering false documents and fraud under $5,000 involving a stolent purse stolen from MRU on Feb. 1, 2011 — a week before her election as student president. Additionally, SAMRU was investigating its executive council after financial inconsistencies were found during a periodic review, which may have prompted Melnyk’s Jan. 25 resignation. Six days after Melnyk’s resignation, SAMRU issued a release stating that she had resigned after the first of two regular periodic reviews revealed unexplained inconsistencies. “The review identified several potential anomalies and policy compliance issues for which Council was unable to receive a satisfactory explanation within a reasonable time frame,” reads the release. SAMRU VP external Michelle Dennis later confirmed the anomalies were financial in nature, but few other details have been released. SAMRU did not release details on what was found in the review, stating they cannot legally share personnel information. As of March 2, SAMRU completed their investigation of Melnyk and handed files on her over to police to aid a criminal investigation. Students and faculty were bewildered by the news. MRU president David Docherty echoed those sentiments. He said Melnyk may have resigned from her post, but she was still a Mount Royal student at the time. “We are concerned for her well-being just as we are for all members of our community,” Docherty said, in a statement released through Facebook. Melnyk herself never offered a reason for her resignation. “I am moving on to other opportunities and wish my colleagues the best of luck,” she wrote in an email to The Reflector on Feb. 1. However, she indicated that the pressures of her role were putting her under stress. In an interview on Jan. 13, 2012, Melnyk said she was not planning another term as president. When asked about her future, Melnyk said she didn’t know yet, implying she was torn between job offers and remaining at MRU to finish her studies. “I’m so close,” she said. “I’m one year away from my degree.